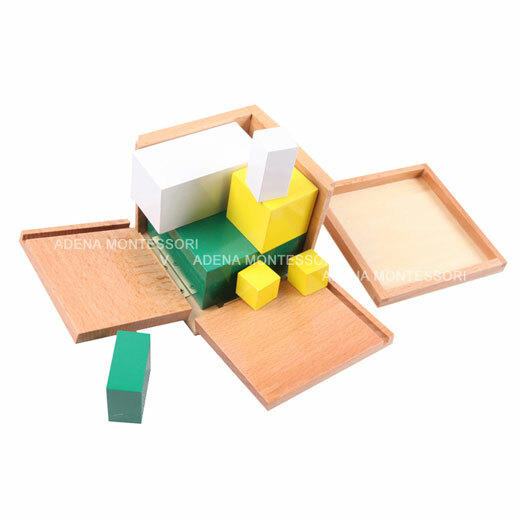 A wooden box with a lid containing 7 painted wooden cubes: 3 yellow cubes, 2 green cubes and 2 white cubes. The box is hinged and opens out to display the cubes. Consist of seven pieces of wood. Two yellow cubes and two rectangular white, two green rectangular, one yellow cube and a cube box constitute. High-grade imported wood (beech), safety and environmental protection paint, surface treatment. Purchasing this will earn you 20 rewards points!